Smart Fortress 2012 is a malware client. This program has gone through several variations in the past including MS Removal Tool, Smart Protection 2012, Personal Shield Pro and System Progressive Protection to name a few. All messages this program gives off are false warnings. What is Smart Fortress 2012? Smart Fortress 2012s is a false security client. Once installed on the users computer it acts like a real security client. All the scan results and warnings given off are bogus. How Did I get infected with Smart Fortress 2012? There are several ways in which users get infected. The main reason is from a drive by download. This happens when a normal website gets hacked and malisious code is installed. When you visit the website a forced download happens and the virus installs it's self. If you did not install any programs at the time you got infected then chances are you did not have a good antivirus to protect your computer. You should consider upgrading to a antivirus client that can block such infections. What is Smart Fortress 2012 Doing to My Computer Right Now? Removal all spyware from your PC!" From our testings we found that Smart Fortress 2012 will block executable files from running. This can make it very hard to remove. Here are some examples of FALSE messages that Smart Fortress 2012 puts out. Click here to remove them immediately with Smart Fortress 2012. You need to remove Smart Fortress 2012 as soon as you can. In many cases users have other hidden trojans installed on their computer as well. This is why it's so important to run a full virus scan even if you follow the manual removal guide below. 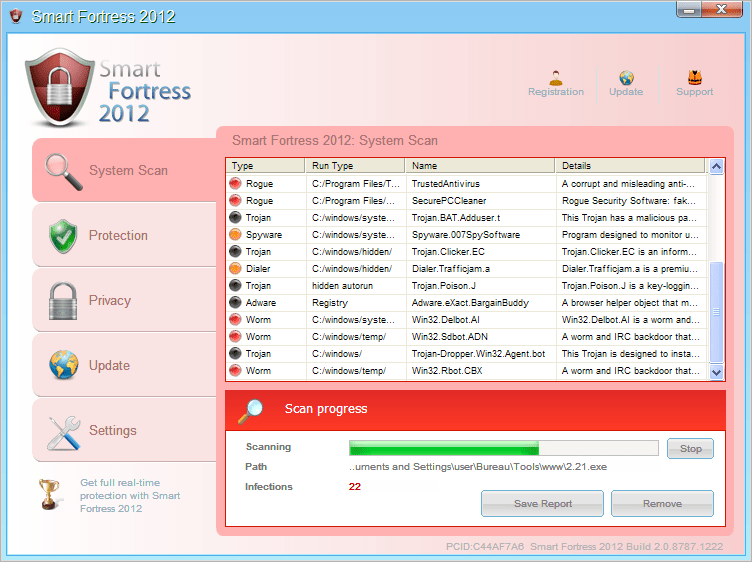 Be sure to run a full virus scan once you have manually removed Smart Fortress 2012. The first step you must take in order to remove Smart Fortress 2012 is to stop the following process. Watch the video for guidance. Once you have deleted the above executable, Smart Fortress 2012 will no longer be running. At this time you need to run a full virus scan. RUN THE SCAN!. We recommend wither Spyware Doctor with Antivirus or Spyware Doctor with Antivirus. You need to ensure no other viruses are on your computer. So many people skip this very simple step. Take an extra few mintues and ensure you have all the viruses removed. It is not recommended for inexperienced users to attempt to delete Smart Fortress 2012 manually, as any mistake made during removal could result in your system getting damaged. Therefore, inexperienced users are advised to use a web-based repair service such as www.pcninja.com or legitimate antivirus software such as Spyware Doctor with Antivirus to completely and safely remove Smart Fortress 2012. Many of our users report they realy like the look and feel of Spyware Doctor with Antivirus so that is the main client we have been starting to recommend. We have also created a dedicated site at http://www.removemsremovaltool.com to help people out. if you have the latest Smart Fortress 2012, it’s possible that none of the provided instructions to stop the process will work.